At Palazzo Stone , we specialist in designing, manufacturing and installing all marble worktops and other stone worktops throughout Dover. We have many years of experience so you can trust us with your feature kitchen marble countertops. As manufacturers, we are able to ensure the quality of our products by managing the entire process. Purchasing directly from us allows our customers the ability to make considerable savings. 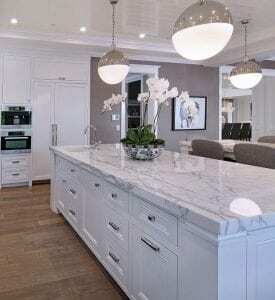 Our aim is to eradicate the misconception of many people who perceive that marble work surfaces are expensive products and most likely an item not possible for the average home. We offer a free design and costing service and because we import and manufacture our own marble worktops we are often 30% cheaper than most of our competitors allowing us to pass the savings on to you. Our lowest price pledge guarantees to beat any cheaper written quote for the same product. Nothing is more beautiful and hard-wearing than a genuine affordable marble worktop, choosing from the variety of styles and colours on offer will ensure a beautiful and unique look which will guarantee to improve and add value to any kitchen.